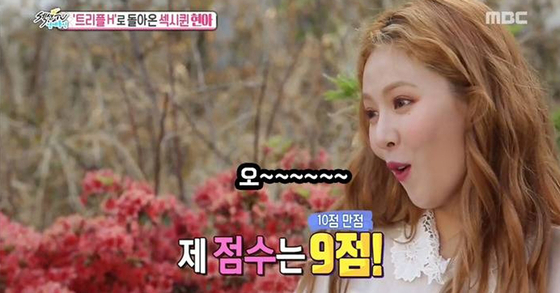 The aftermath of HyunA and E'Dawn's acknowledgment on their loving relationship is still continuing. 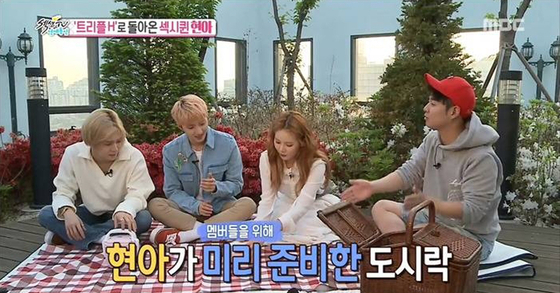 While audiences have discovered that they secretly exposed affections toward each other in numerous cable programs, some others claimed that the couple failed to hide their innermost feelings in public TV channels. In June, TripleH appeared on MBC's Section TV Entertainment News. 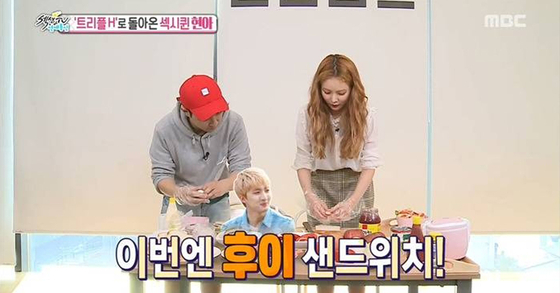 This program featured HyunA making sandwiches for E'Dawn and Hui, two PENTAGON members in TripleH. 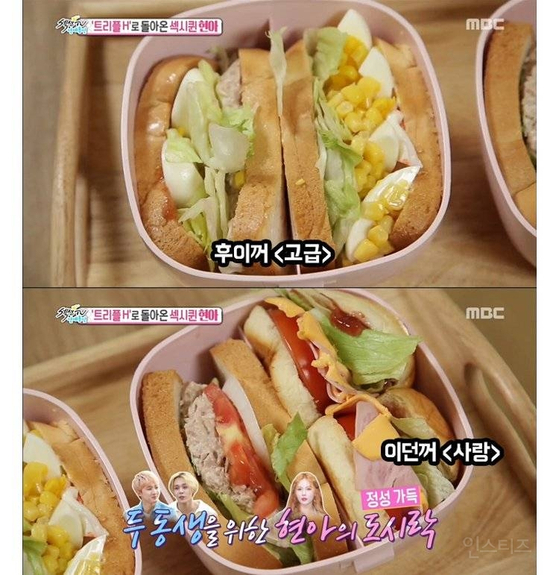 Nobody might have known the romantic relationship between the two back then, but HyunA named E'Dawn's sandwich "A sandwich with love", putting numerous ingredients like tomato, ham, cheese, lettuce, and strawberry jam. Hui's was called "Exclusive sandwich" and it had crab meat, lettuce, boiled egg, and corns in it. 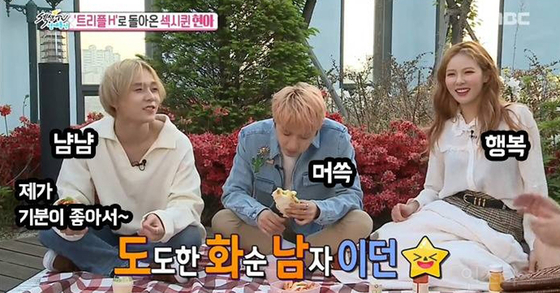 As ingredients in E'Dawn's sandwich seemed more colorful and tasty than Hui's, fans argued "HyunA even in the tv programs biased E'Dawn" and "It doesn't seem right to discriminate people with foods". 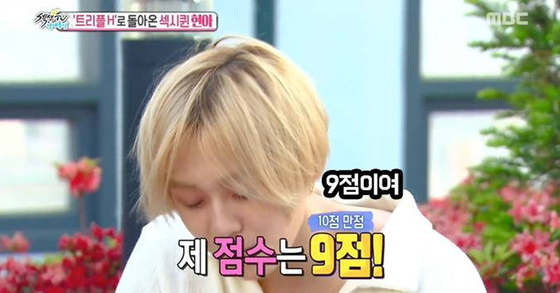 After tasting, Hui gave 10 points in evaluation while E'Dawn gave 9 points. 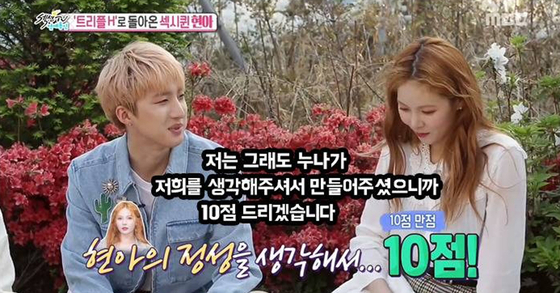 It was Hui who rated her food higher, but HyunA seemed deeply affected by E'Dawn's evaluation. And this aroused fans' rage once again, claiming that she put Hui in an awkward situation. It's rare to find fans bringing back the former broadcasts as the dating evidence. If you put the compiled scenes of the couple together, it's visible that fans have ill feelings toward the two for extending their private feelings into their workplaces. Perhaps it's because Korean fans wish artists to use broadcast as a tool to connect themselves to fans, not as their dating stage. And many are concerning Hui, who might have been isolated by the couple's deep affection. Upon HyunA's sudden acknowledgment on her relationship with E'Dawn, TripleH reluctantly canceled performances at SBS' Inkigayo, MBC's Music Core and even a fan signing event, practically concluding the promotion of Triple H.